Fooditka: A Very Whoopie (Pie) Friday! A Very Whoopie (Pie) Friday! Today was fun. Well first off, it's Friday and secondly, it's a pretty relaxing one at that. 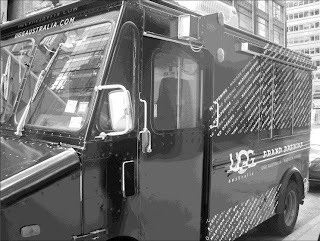 That's why I took every opportunity to take advantage of a free treat today, courtesy of UGG Australia and the Street Sweets Truck. 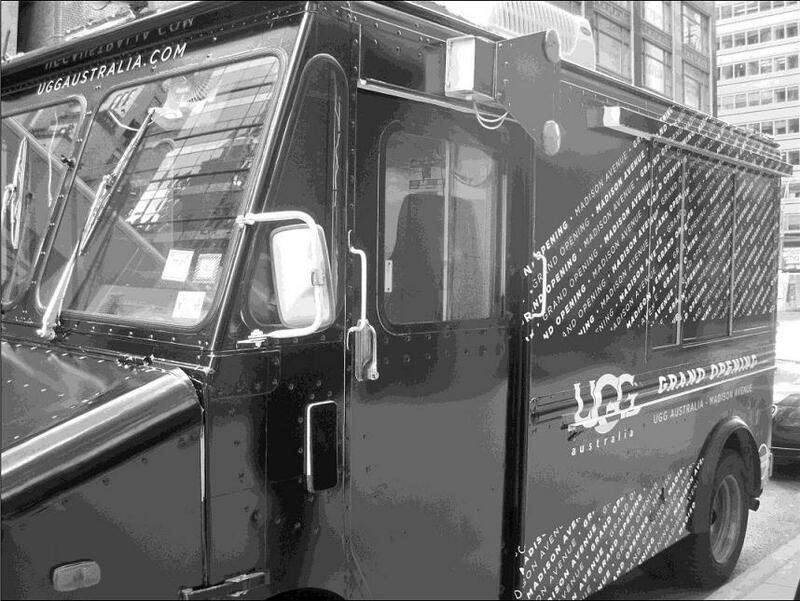 Truth is...I've been wanting to check out this truck for a while now and I could never catch it at a convenient time. 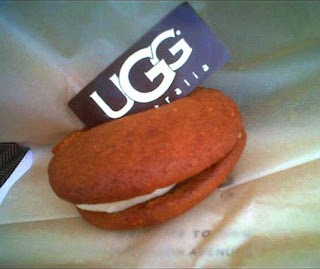 So when I found out they were doing a special whoopie pie giveaway in front of the new UGG store on Madison Ave. and 58th Street, I was so there. Correction - Bo and I were so there. The free whoopie pie giving was scheduled to start at noon sharp and in our customary geekery, we showed up about ten minutes early. Sure we were the only two people standing in front of the closed up truck, inspecting it from all angles and wondering when the treats would roll out...but so what?! Nothing wrong with a little enthusiasm. We took a couple of Street Sweets Truck shots and waited patiently until noon, upon which the truck window opened. A perfectly pleasant representative appeared with her outstretched hand, in which lay a pretty whoopie pie. "Pumpkin or chocolate?," she asked. We both looked at each other and without hesitation said "pumpkin." Pumpkin Whoopie Pie - If this was a way to introduce us to Street Sweets, then sign me up. The whoopie pie was nothing short of delicious, from its slightly spicy soft cookie to the creamy, silky middle. Both of us loved that the actual cookie wasn't too sweet but tasted a bit like gingerbread. Since the filling was super sweet, the cookie was the perfect complement and the two went together like NYC girls and UGG boots. The "UGG" signage you see above was actually a piece of dark chocolate, which we thought was clever and also tasted very good. All around, a very solid treat and a nice way to welcome a new retail neighbor to the 'hood. If you're eager to check them out, the whoopies should be there until 6:30 p.m. today. So stroll on over and see if you can get a free Friday street sweet. Happy weekend! Follow Street Sweets on Twitter and check back for their future appearances. The UGG store is cool too and located at 600 Madison Avenue.